Health research with nonhuman primates takes place at many universities and research institutions in the US, among them centers funded by the National Institutes of Health (NIH). 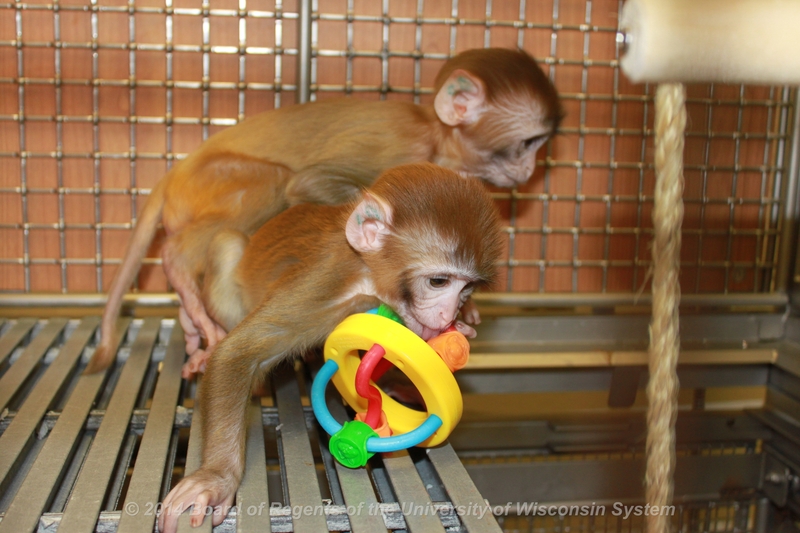 A broad range of research aimed at better understanding maternal and child health takes place at these centers and depends, in part, upon humane, ethical scientific studies of infant monkeys. A sample of the research areas and findings are highlighted below and provide a view of the value of developmental research. What even a short list shows is that the scope of scientific and medical research that informs pediatric health issues is large. It ranges from autism to childhood diabetes to leukemia to mental health to stem cell therapies. Together, the findings from studies of infant monkeys have resulted in a better understanding of prenatal, infant, child, and maternal health. The scientific research has resulted in basic discoveries that are the foundation for a wide range of clinical applications and have also improved outcomes for premature and critically ill human infants. Studies of monkeys are a tiny fraction of all animal studies and are only conducted when studies of fish, mice, rats, or other animals are not sufficient to address the scientific question. Like all nonhuman animal studies, those of young monkeys are subject to rigorous ethical evaluation by scientists, by federal review panels, and institutional review boards that include veterinarians and members of the public. The decision to conduct a study in nonhuman animals is one that rests on weighing both the potential benefit the work may provide and any potential for harm. The research below provides many specific examples of how and why the studies are conducted and their benefit. For each and every study, scientists, review panels, and ethics boards also consider the potential for harm that may result to the nonhuman animals that are involved. Whether there are any alternatives to the animal study is a requirement of the US system for ethical review and oversight. If there is no alternative, reduction in potential for harm is explicitly addressed not only by a set of standards for animal care, housing, handling, environmental enrichment, and medical care, but also by including only the number of animals needed to answer the scientific question. (You can read more about the review process, regulation, and care standards here and here). Like other studies of nonhuman animals, those in young animals require serious and fact-informed ethical consideration. At the most fundamental level they challenge us to evaluate how we should balance work that ultimately can help children, the harm that may result from a failure to act, potential harm to animals in research. Consideration of how to balance the interests of children, society, and other animals is not an easy task. Nor is it one that is well-served by simple formulations. Primate studies of early development have, and continue, to contribute valuable new insights and discoveries that improve the health and lives of many. The examples below, from NIH-funded research programs across the US, demonstrate how the work contributes to public health. A goal of Yerkes National Primate Research Center (YNPRC) infectious disease researchers is to identify the sources of the latent HIV reservoir so targeted cure strategies can be developed. A first step is to develop a novel model of SIV infection and cART treatment of nonhuman primate (NHP) infants to interrogate the SIV reservoir. The development of such a model will greatly facilitate future studies of SIV reservoirs and the design and testing of novel reservoir-directed therapeutic strategies before scaling to clinical trials in HIV-infected patients. YNPRC researchers have successfully created a transgenic, preclinical animal model of Huntington’s disease (HD). These animals, when followed from infancy to adulthood, show progressive motor and cognitive associated with neural changes similar with the disease patterns seen in humans. Not having such a model has been a major roadblock to developing effective therapies for the disease. Studies at the CNPRC have proven critical in gaining approval for investigational new drug (IND) applications to the FDA and conducting first-in-human trials of (1) an expressed siRNA in a lentiviral vector for AIDS/lymphoma patients,, and (2) achieving the overall goal of utilizing adeno-associated virus (AAV) expression of human acid alpha-glucosidase in 3 to 14-year-old Pompe patients who have developed ventilator dependence.